One of those types of meals that has comfort written all over it. Loaded. Beefy. Classic carnival food kind of good. Beef Chili Dogs, a food truck concession that brings droves of customers to stand in line, pay up a few bucks and walk away feeling satisfied. Kind of like Walking Tacos or a Freshly Squeezed Lemonade…unbeatable flavor! Load it up over fries, a baked potato, or chow down on this chili all on its own. This is a meal in itself. 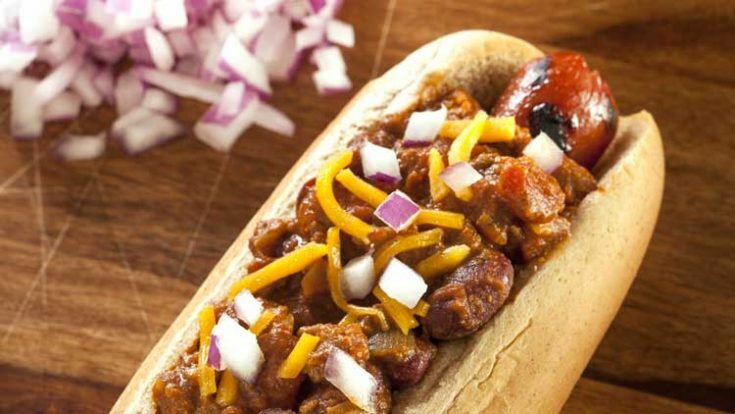 However–it’s also perfect to make a Chili Dog with so we totally get that you might reserve this hot dog sauce specifically for Chili Dog day. We get it. No matter what type of chili you’re after, you’ll love all of these tasty recipes. So good! 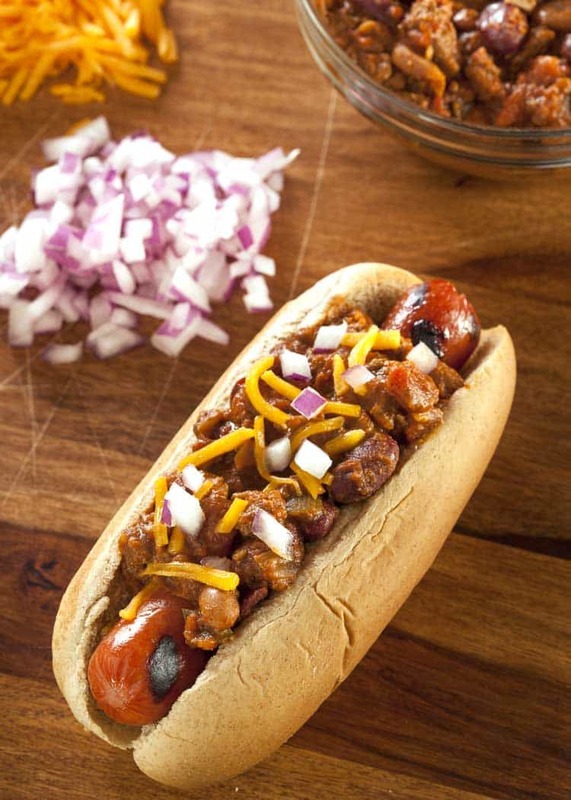 If you’ve been craving a hot dog and chili, combine the two for the perfect chili dog loaded with sauce, cheese and onions. Really, you can mix things up and put whatever your favorite toppings are on top of that delicious hot dog. We like to load ours up with cheese and onions, but have a selection of toppings on hand if you’re feeding a crowd so everyone can pick their own faves! These Copycat A&W Beef Chili Dogs are amazing! This classic recipe is a keeper and one you'll love to have on hand for quick dinner ideas. Brown the ground chuck in a 2 quart saucepan, breaking meat into very small pieces. While cooking, lightly season meat with salt and pepper. Add the tomato paste, water, sugar, yellow mustard, onion, chili powder, and Worcestershire sauce. Simmer for 30-45 minutes, uncovered, until it thickens. Allow to cool, cover, and refrigerate until time to slather on your frankfurter. In a 2 quart saucepan, bring water to a rolling boil. Removing the saucepan from the heat, add frankfurter to the water. After the frankfurter is done, microwave the chili dog sauce until steaming. Microwave hot dog roll for 10 seconds to warm. Adapted from Best Copycat Recipes. I love hot dogs! They are one of my favs since childhood, I can’t quit put my finger on it though. Yum, this looks good! We like to do a quick grill after boiling. Love the look and the taste!